François-Guy Thivierge is one of the rare individuals to have reached the highest summit on each of the seven continents and also to have explored both poles. He offers an account of an extraordinary adventure dotted with pitfalls, which for readers will prove to be a source of inspiration. All will uncover a breathtaking story and a lesson on how to approach personal challenges, whatever they may be. 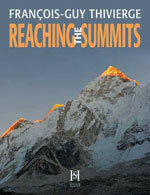 The volume will be published simultaneously in English and French (Aux Sommets, isbn 9782923794327) in fall 2011.